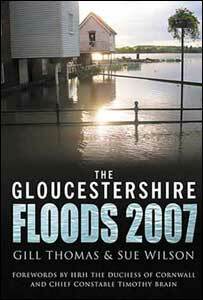 Members of Gloucestershire's Federation of Women's Institutes (WI) have put together a book about their experiences of living through the summer floods. The Duchess of Cornwall, a member of the Tetbury branch, has contributed to the tome, which will be sold to raise money for the Flood Relief Fund. Personal accounts include being stranded during flash flooding, coping without water and dramatic rescues. The book is illustrated with 100 photographs taken during the flooding. In her foreword, Camilla speaks of the true British spirit she and the Prince of Wales encountered when visiting flood victims. Gloucestershire's Chief Constable Timothy Brain has also written a foreword, praising the work done by organisations and communities in getting life back to normal as quickly as possible. The book was the idea of Gill Thomas, the county chairman of the WI. "Royalties from the book will help flood victims, many of them WI members themselves, some still living in temporary accommodation," she said. "At the same time it will become a historical record of what happened during those difficult weeks in the summer." The book was compiled and edited in five weeks by Gill's colleague on the WI county executive, Sue Wilson. "The stories are compelling and will strike a chord with everyone who was in the county at the time," she said. "They also give an insight to those not involved of just how a community copes under the sort of pressure we all had to deal with this summer."